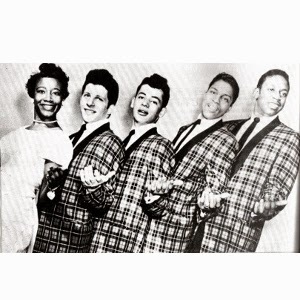 Talmoudge "Tommy" Gough (fourth from left), an original member of the Crests, died last Sunday, August 24, at his home in Flint, MI from throat cancer. He was 74. The Crests were created while Gough was still in his teens with J.T. Carter, Harold Torres and Patricia Van Dross, the older sister of Luther Vandross. Carter added Johnny Mastrangelo, who would become Johnny Maestro, to be lead vocalist, creating one of the first racially mixed doo wop groups. In 1957, they signed with Joyce Records and released their first minor hit, Sweetest One, which went to number 86 nationally. The next year, they moved to Coed Records, minus Van Dross, and recorded the song that would become their biggest hit, Sixteen Candles. The smash went to number 2 on the pop and 4 on the R&B chart and put the group on national TV shows like American Bandstand. They never reached the top ten again but did have some lesser hits over the next three years with Six Nights a Week (1959 / #28 Pop / #17 R&B), The Angels Listened In (1959 / #22 Pop / #14 R&B), Step By Step (1960 / #14 Pop) and Trouble in Paradise (1960 / #20 Pop). Maestro left the group in 1961, although he would attempt to get another hit under the name Johnny Maestro and the Crests, using a new roster of members. James Ancrum took over the lead and the group recorded the single Guilty which didn't crack the top 100. Gough left the group soon after the release in 1963. Gough did reunite with Maestro, Carter and Torres in 1987 for a concert in Peekskill, NY. The Crests, with Gough, were inducted into the United in Group Harmony Association (UGHA) Hall of Fame in 2000 and the Vocal Group Hall of Fame in 2004. Original Crests member J.T. Carter wrote on his Facebook page "RIP - "Tommy" Talmadge Gough original member of The Crests who passed away yesterday. If it were not for you, I would have never been involved in music or The Crests!!! You are a true musical icon... Sing on with the stars in heaven my friend, you will be greatly missed! You are the one that created a rock-n-roll heaven!! Love you my friend!! Peace and love.... Always, JT!!"